This is not your average Himalayan trek. 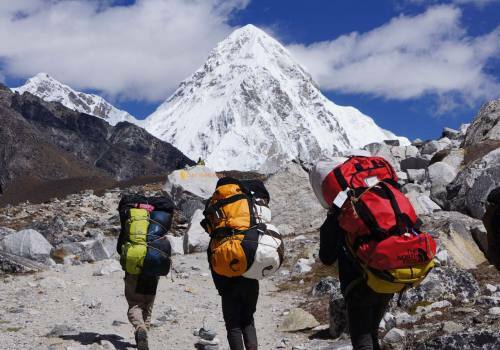 Nestled between the famous Langtang National Park and the world-renowned Annapurna Conservation Area, the Manaslu Circuit Trek is often overlooked. However, the trek is nothing short of amazing. 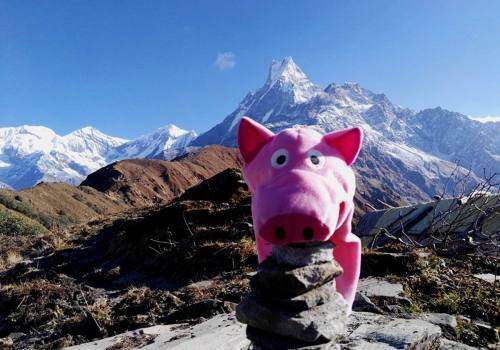 Some consider it the best all-around trek in Nepal, and is compared to the Annapurna Base Camp Trek without the loads of trekkers. It is a most adventurous trek and the fact that it is not heavily trafficked adds to the allure. The Manaslu Circuit Trek, a somewhat strenuous trail, circumnavigates the 8th tallest mountain in the world – the magnificent Manaslu (8156m). 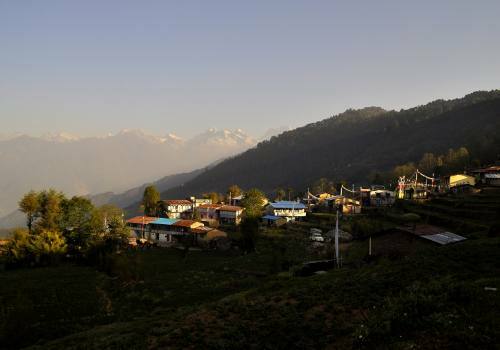 We begin the Manaslu Circuit trek by weaving through ethnically Gurung villages. 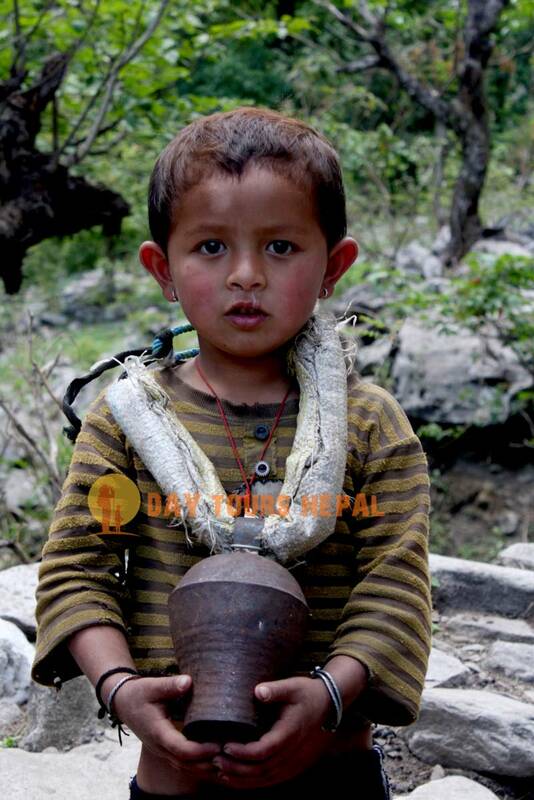 As we climb higher into the hills, the residents of the villages are ethnically Tibetan. The generous villagers, through the trek, offer great hospitality. As is the case with most treks in Nepal, half of the beauty is found in the glorious views, while the other half is in the caring, compassionate people we meet in the villages. The kindness of those in the mountains and hills in this area goes above and beyond our expectations. After our scenic drive from Kathmandu, surrounded by cascading waterfalls and picturesque terraced hillsides, we begin our journey in Soti Khola (700m). We walk north along the banks of the majestic Budhigandaki River. We’re surrounded by agricultural fields, rugged mountains, and fresh air. The area is known for its rich biodiversity, so keep your eyes peeled for the musk deer, lynx, Asian black bear, various monkey species, the Himalayan goral, and countless other species in the area. We continue our gradual ascent, to acclimatize properly. If you have interest, we can stop at the hot springs in Tatopani to let our bodies heal and rejuvenate. As we gain altitude, we must take our time. It’s a must in order to prevent sickness, especially as we cross the Larkya La Pass (5135m/16,847ft). After a few more days of trekking, we’ve found ourselves at the pass. Feeling like we’ve reached the top of the world, we are filled with joy. We jagged mountain peaks surrounding us, we feel like we’re in a different universe than the city we left just a few days ago. Manaslu and the surrounding awe-inspiring peaks reach high above the clouds. Adding a bit of adventure to the experience, the pass is usually covered in snow. The unforgettable alpine views, rich biodiversity, thick forests and exceptional hospitality of villagers make this trek one of the best. Eventually, after a peaceful and relaxed descent from the pass, we arrive in Dharapani and take a two-hour drive to Besisahar, where we stay for the night. 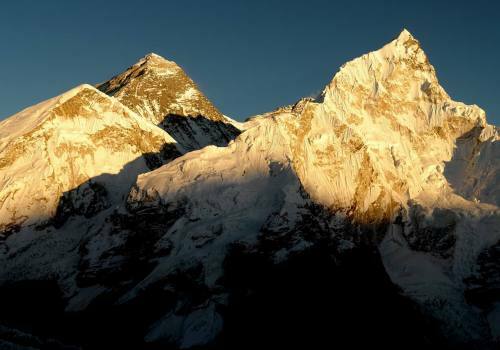 The following day we regrettably depart from the mountain and return to Kathmandu. Please note that this trek can be combined with the Tsum Valley Trek. Memorable moments with our team. Day 03:Kathmandu drive to Arughat Bazar. Altitude; (610m) 2,001ft Our Manaslu circuit adventure starts from this morning after the breakfast. 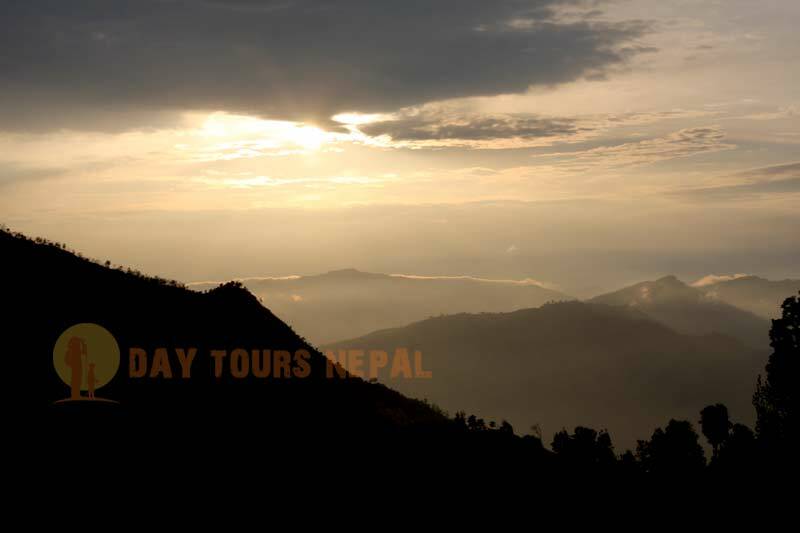 Day Tours Nepal guide will come to your hotel at 6 to 7 am in the morning, till that time you need to finish your breakfast and packing. We will take a scenic 4WD jeep drive towards to Arughat Bazar. Roads are snaky and mostly we will be on bumpy roads, definitely tiring but enjoyable drive. Overnight in normal tea houses. Day 04:Trek from Arughat to Lapubesi (7hrs) The proper adventures and the taste of Manaslu Trek starts after the mountain breakfast. Fun part, your breakfast order will be taken before going to bed. While coming for breakfast pack your bags so it will be easy for our guys to eat and run. Normally porter will walk faster and they will be waiting at the lunch place or it depends on the person nature. We will be walking through typical Gurung and Magar villages but also on the roads without seeing vehicle. Tricky climbing over cliffs (not technical ) while walking towards our next destination Lapubesi. Over night at Lapubesi tea house. Day 05:Trek from Lapubesi to Khorlabesi 970M (6hrs) As usual other morning your breakfast will be ready and start walking. Guide will give you the day briefing and the place for lunch stop. Normally guides will give you the people and cultures of the day. So today we will pass through the Gurung people village, Maccha Khola, (a river) Buri Gandaki (river). We will see Monkeys, Langurs and possibly other wild animals walking through the forest. Overnight at Lodge. Day 06:Trek from Khorlabesi to Jagat 1340M (6hrs) Continue walking to Jagat, our destination for today. 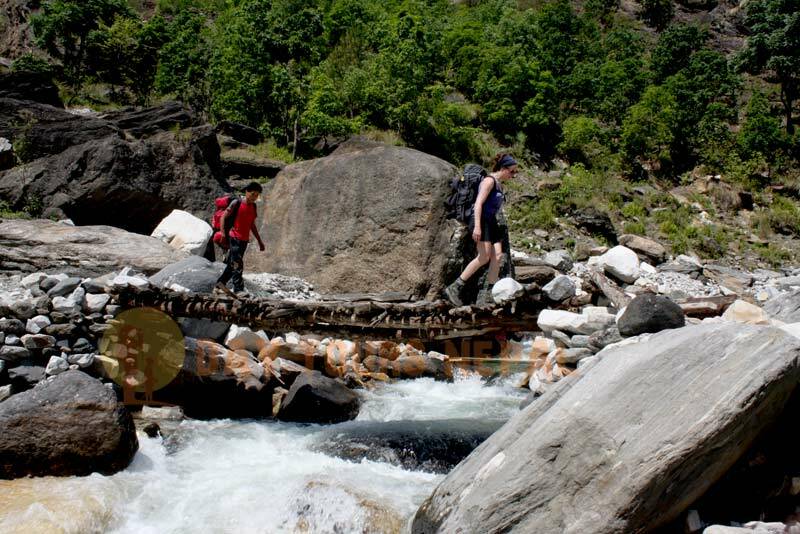 Walking through narrow trail, crossing Hot-springs following Buri Gandaki river, and the suspension bridges. 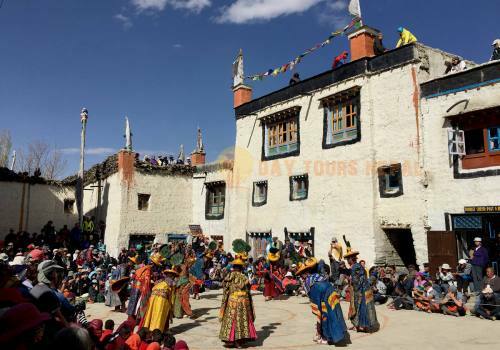 Jagat is the Tibetan trade village and also the place where we entry our permits to MCAP. Overnight at Jagat. Day 07:Trek from Jagat to Deng 1860M (6hrs) Today the place where we stay in Deng and the Gurung people from Deng they practice Buddhism. We will pass through many villages and the mountain farming, rivers, and the Mountain peaks. Trails is generally up and down and somewhere flat but somewhere tiring climb up. Overnight at lodge. Day 08:Trek from Deng to Namrung 2630M (6hrs) Roaring river, seep climb but the day gone be interesting with the different landscapes and varieties. The trail is more spiritual with the Mani walls carvings of various Buddhas in Meditation. Walking through beautiful fir and rhododendron forest with birds sounds and the some wild animals will lead to our destination Namrung. Overnight at Lodge. Day 09:Trek from Namrung to Samagaon 3520M (7hrs) Today you will feel like you are walking in small tibet where mostly the people are dressed like Tibetans. We will pass through Mani, local village, rhododendron and oak forest. It feels like you are in different world with Yaks and the amazing views of Mt. Manaslu (8163m) and Manaslu North (7157m). Normally in this valley people only grow potatoes and Barley, don’t miss the potatoes because it’s organic. Overnight at Lodge. 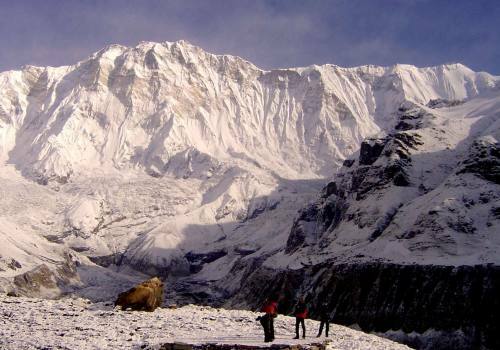 Day 11:Trek from Samagaon to Samdo 3875M (4hrs) We can expect lot’s of Yaks and the chilly wind so don’t forget to carry windproof jacket in your daypack bag because porters will be walking ahead. 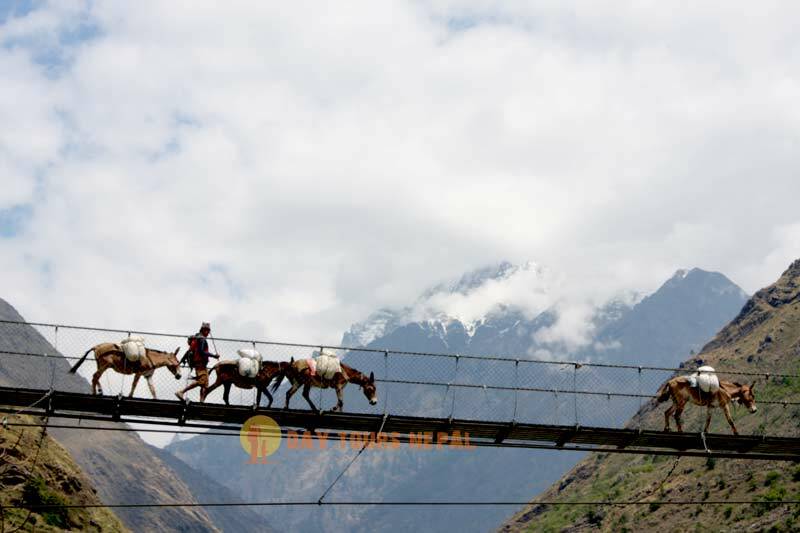 Walking under the iceberg under the Manaslu glacier, crossing the Buri gandaki wooden bridge will lead our trail to Samdo. We can see the Tibetan commercial track over the Lajyang but it’s closed now. Easy walk of the day, if you want to try Tibetan beer, you can get here. Overnight at Lodge. Day 12:Trek from Samdo to Dharamsala 4460M (4hrs) Short walk but we will reach the last highest point after crossing the Buri Gandaki river. Narrow trails, mani walls, and small shelters will lead our trail to Dharmasala. Dharmasala will be quite busy and the things might not properly arranged. All the trekkers spent a night here before crossing Larkya-la Pass. Food might not taste the same which you have been getting before and the rooms might not be possible in peak season so have to adjust in dinning halls, or sharing with other hikers. Overnight at Lodge. 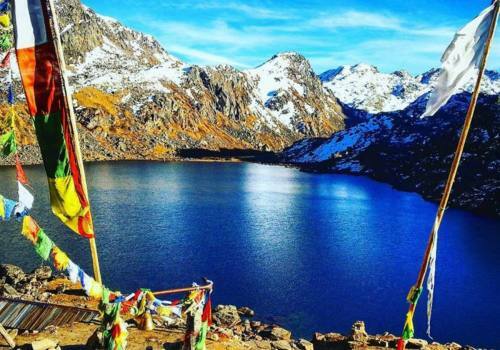 Day 13:Trek from Dharamsala to Bimtang 3590M (9hrs) via Larkya-La Pass 5160M Early breakfast and start walking over the ride and the lake Glacier. Trails is rocky and moraine but not hard but it’s a long walk. For this kind of hike the hiking poles are helpful, descend four frozen lakes and the tiring body reach up to Larkya-La (5100M). If you want to carry prayers flags to put on the heights than buy in Kathmandu. At the Lakrya - la height we will not stay for long because of windy and cold so we will walk further ASAP. Trails is pretty long and gravel, rocky, and moraine but the scenic Bimtang will makes you to forget the tiring way. Slowly but steady will take you to Bimtang. Overnight at Lodge. Day 14:Trek from Bimtang to Dharapani 1860M (9hrs) You must have been feeling tired this morning because of last day but another beautiful and different place is welcoming us. After local breakfast start our adventure walking on the moraine, and Bhimdang Glacier. But it won’t be for long as soon as we cross the glaciers we will be in Rhododendron forest (End of March - April is the time for Rhododendron flowers), and pine will give you peaceful walk. 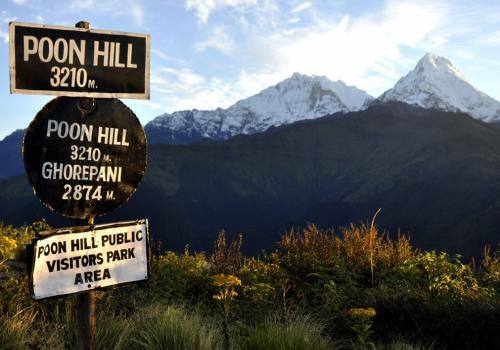 Dharapani is the way to Annapurna Circuit trek, and we will stay a night at lodge. Day 15:Trek from Dharapani to Syange 1100M (7hrs) Following the Marshyandi river, crossing bridges and the small villages towards to Syange. Somewhere it’s rocky trail but also we will walk through the road somewhere mostly the vehicle are accessible up to Manang village but few jeeps only. Syange is small village and enjoy the evening with waterfall and the last night at lodge. Last night with our porters over here because some of them will leave next day from half of way. Overnight at lodge. 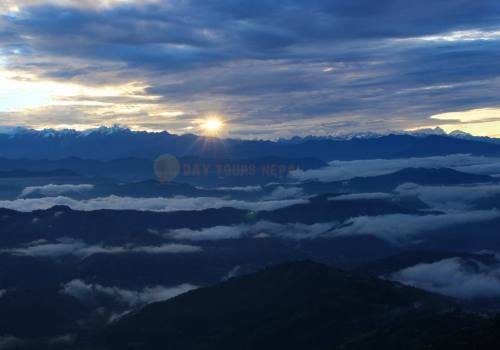 Day 16:Drive from Syange to Kathmandu via Besisahar (7hrs) Enjoy the morning breakfast, our guide will arrange the vehicle from here to Beshisahar and from Beshisahar our vehicle will pick to drive back to Kathmandu. If you want to shake hand with porters and the crew who help you for Manaslu Circuit than today is the last day. After arriving in Kathmandu guide will check in your hotel, even farewell dinner at western restaurants (might be tired from Dal Bhat). 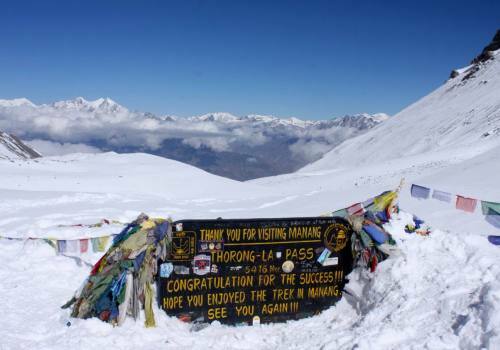 Manaslu National park, Annapurna Conservation, special trekking fees and TIMS card. Updated Manaslu Circuit Trekking Map. The Manaslu Region is a restricted area, meaning that you need a special permit, as well as a licensed guide, to enter. From September to November, the cost is USD $70 per week per person, and after 7 days, it is an additional $10 per day per person. From December to August, the cost is USD $50 per week per person, and after 7 days, it is an additional USD $7 per day per person. Two additional permits are required (ACAP and MCAP), each valued at NPR 2000 (USD $20). The Manaslu Circuit Trek requires little fitness and acclimatization to avoid acute mountain sickness. 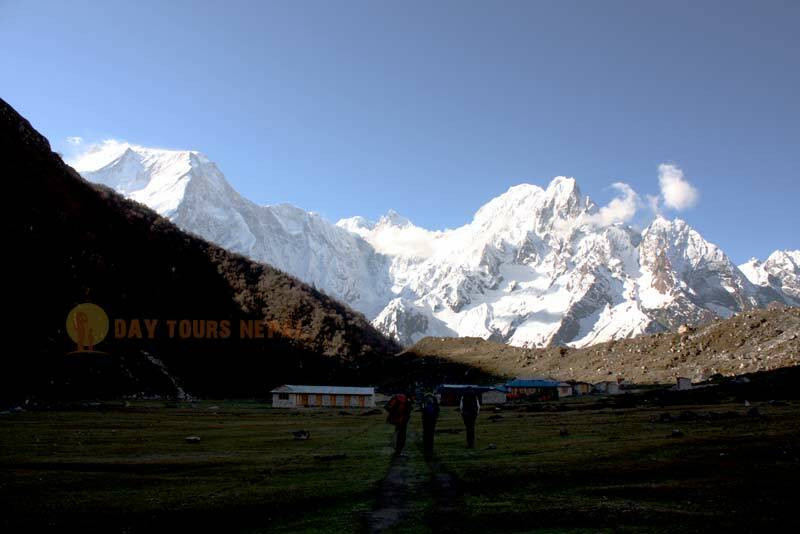 Day Tours Nepal arranges the trek with complete management. Please, feel free to contact us for more detailed information. In case of any emergency during the trip, Helicopter will be arranged by Day Tours Nepal. The charges must be paid by the clients themselves or your insurance will pay to the Helicopter. 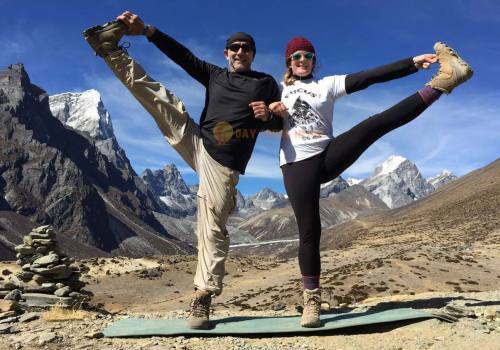 Before starting the Manaslu Circuit Trek email to your Insurance company that you are in this trip and if something happen Day Tours Nepal take actions and call to the Insurance. 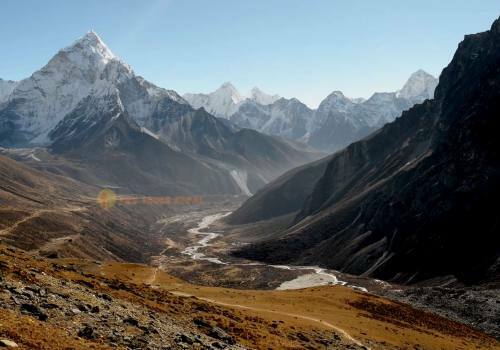 Manaslu circuit trek days are not and not suitable for you? E-mail us we will customized the trip.